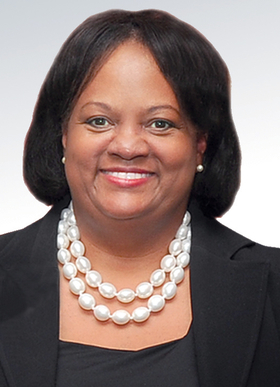 Dr. Regina Benjamin is a board member for Ascension St. Louis. It's been nearly three years since former U.S. Surgeon General Dr. Regina Benjamin stepped away from the public eye as the nation's top doctor. As the driving force behind the creation of the White House's National Prevention Strategy, she worked to reduce preventable illness as a means of addressing health disparities within the poorest communities. Benjamin, 59, has remained focused on those issues even as her role has changed. Since joining the board of directors of Catholic healthcare giant Ascension in September 2013, she has guided the nation's largest not-for-profit system as it has embarked on new initiatives to address health challenges at the community level. As part of that philosophy, Benjamin urged Ascension to become more engaged with the communities it serves, applying concepts within the national prevention strategy, bringing system leaders and community organizations together to collaborate on prevention. That objective was the impetus behind Benjamin convening Ascension's first Community Health, Equity and Inclusion Conference in New Orleans in 2015, which brought together more than 150 of the system's leaders—from 1,500 locations across 23 states and the District of Columbia—to discuss strategies that enhance their work in improving outcomes at the local level. “Her persistence and diligence are really helpful at the board table,” said Anthony Tersigni, CEO of St. Louis-based Ascension. Tersigni said her advocacy for health equity across gender and ethnicities has been critical in her role on the board as she holds the system accountable to stay true to that mission. Benjamin's work with Ascension is just the latest in a lifetime of advocacy to address population health. For her many achievements, she has been chosen to receive this year's Excellence in Governance award for healthcare systems. After receiving her medical degree from the University of Alabama in 1984, Benjamin completed her residency at a family practice in Georgia before serving as medical director for several nursing homes. In 1995, Benjamin was the first physician under age 40 and the first African-American woman to be elected to the American Medical Association's board of trustees. And in 2002 she became the first African-American female president of a state medical society, when she took the helm of Alabama's state medical association. In 2009, President Barack Obama nominated her to become the nation's 18th surgeon general, a position she held until 2013 when she stepped down to accept the endowed chair in public health at Xavier University of Louisiana in New Orleans, where she emphasized the importance of students promoting public health in community areas most in need. Dr. David Pryor, Ascension's executive vice president and chief clinical officer, said Benjamin's ability to collaborate without losing sight of her goals has been an asset in moving the system toward improving its preventive-care efforts. “She is able to bring people together and achieve consensus while remaining true to her core principles,” Pryor said.